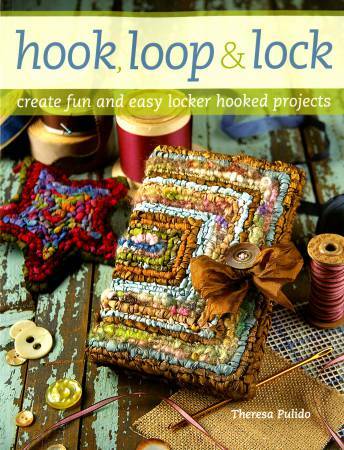 Create Fun and Easy Locker Hooked Projects Go "loopy" for locker hooking—a fun, easy-to-learn method for turning strips of fabric or yarn into fabulous home decor, stylish fashion accessories and one-of-a-kind gifts. In this book, traditional locker hooking breaks out of its homespun country image, showing that it can be bold, modern, wild, whimsical ... whatever you want it to be! You'll be "hooked" once you see the fabulous projects inside—from super-simple candy-stripe coasters and funky placemats, to retro-chic bags, exquisite luminaries and custom cozies for your cell phone, digital camera or mp3 player. Look inside for: **31 original projects from various artists, complete with patterns and step-by-step instructions **a diverse combination of techniques, textures and materials—ribbons, beads and snazzy fibers, silk, mohair, wool ... even recycled plastic bags! **everything a beginner needs to know for happy results, from basic supplies to finishing techniques Recreate a project as-is, or alter colors and patterns to suit your style. Once you've got the basics down, there's nothing stopping you from creating your own original rugs, pillows, wall-hangings and more!